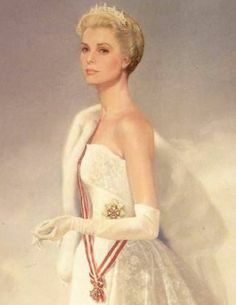 Charlotte continued to wear the tiara throughout her life; she donned it during the celebrations for the wedding of her son, Prince Rainier, in 1956. Rainier’s wife, Grace Kelly, brought an incredible amount of glamour with her when she moved to the tiny principality, but she never wore her mother-in-law’s lovely Cartier tiara in public. The only Grimaldi women who have been photographed in the tiara are Princess Charlotte and Princess Caroline, Charlotte’s granddaughter. Some have even speculated that Caroline inherited the tiara from her grandmother. (We do know that she apparently inherited at least some jewelry from Charlotte; the cabochon sapphire demi-parure that she wears is from Charlotte's collection.) She has worn it for major white-tie events, and she even donned it for a series of Casiraghi family portraits taken shortly before the death of her husband, Stefano. It seems more correct to say, however, that the piece is owned by the Grimaldis more generally, and that Caroline "borrows" it from the family's collection. The family recently loaned the tiara to Cartier for their Style and History exhibition, and notes on the piece are included in the exhibition catalogue. It describes the tiara as being owned by the "Palais Princier de Monaco collection," suggesting that the Grimaldis have placed their jewels (and probably their art and other values) in a kind of family trust -- but one that allows family members like Caroline to continue to use them. I really hope this is indeed the case -- I am a major proponent of jewel foundations, especially those that allow various members of the family to borrow pieces from the collection, as they allow jewels to be seen and worn without the threat of sale that inevitably accompanies personal ownership. The tiara was most recently worn by Caroline during the 2012 pre-wedding dinner for Hereditary Grand Duke Guillaume of Luxembourg. Since then, it has mostly been traveling with the museum exhibition on Princess Grace. Confusingly, that exhibition describes the tiara as being one of Grace's jewels, even though (to my knowledge) there are no photographs of her wearing it. But Cartier notes that after Charlotte ordered the tiara, it was worn by "several princesses of Monaco on various occasions," so it's possible that she wore it privately. (It's worth noting that some believe she was wearing it when she sat for this portrait.) Really, though, what I want to know is this: when in the world are we going to see the current Princess of Monaco take this gorgeous heirloom piece out for a spin?